Since 2011, Statway, an alternative pathway to completing college-level developmental mathematics, has evolved from a two-semester sequence into a single-semester course. As of the 2016-2017 academic year, five institutions have offered an accelerated one-term version of Statway. This paper describes why these colleges chose to implement accelerated Statway, the barriers to success they faced, and the benefits for implementing colleges. 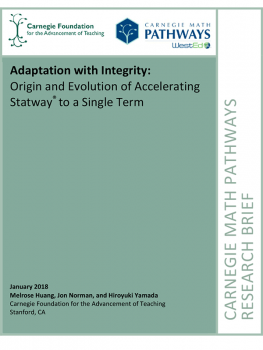 Accelerated Statway offers a rich illustration of how colleges have addressed their local needs by making adaptations to the successful program while maintaining the design integrity of the program as it was originally conceived.